Killed by a Bad Street - who is nicka smith? As I mentioned in a previous post, my father’s family has always been a mystery. Considering that, think of my surprise when I recently saw this headline tied to my paternal side: “KILLED BY A BAD STREET. 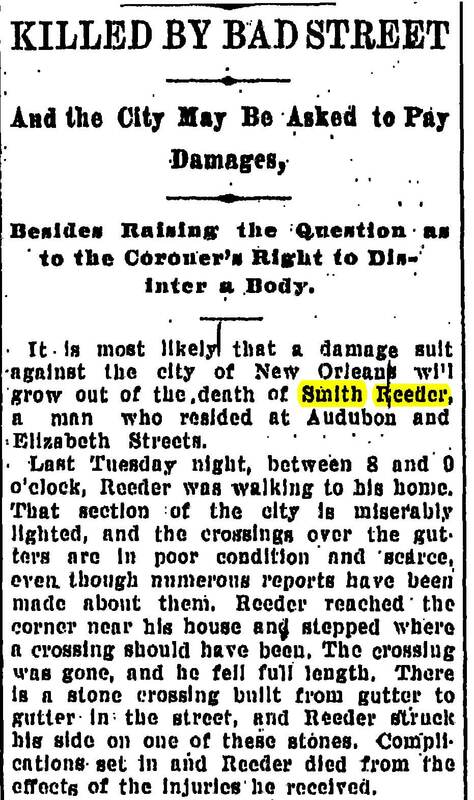 And the City May Be Asked to Pay Damages,” August 21, 1903, New Orleans Times-Picayune. Of course the title of this article sounds crazy, right? I had never heard of anyone being killed by a street. I’ve definitely heard of a car in a street or road killing someone, but never someone being killed by a street. I needed more investigation. 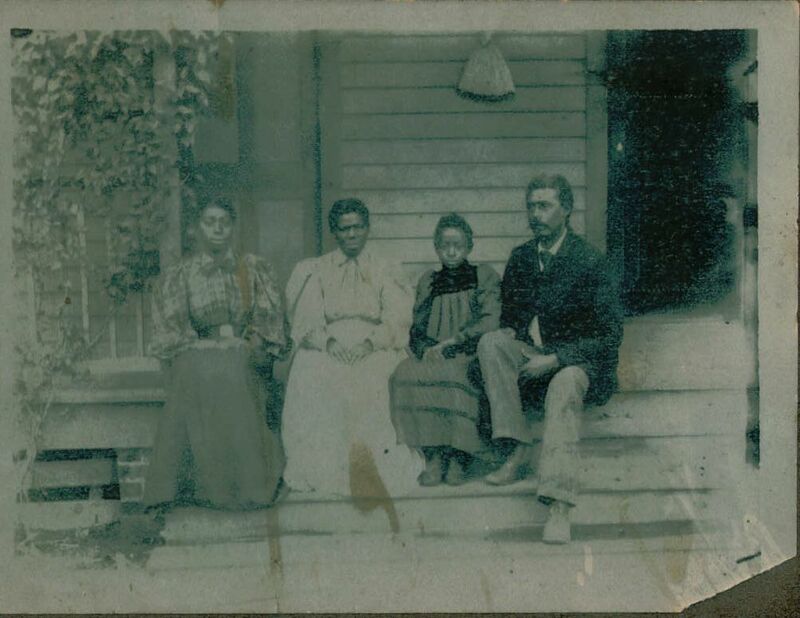 Smith Reeder is my 3x step great grandfather. A few years ago, while I was at the Louisiana State Archives, I got a copy of his death certificate which stated that he died from internal injuries resulting from an accident. It didn’t state details about accident itself. I had always dismissed his cause of death as being something related to his career since I knew he was a carpenter. How did I find the article? First, I searched the Louisiana Biography and Obituary Index on the New Orleans Public Library website. It’s a tool that I’ve used in the past to find the dates and publications that an obituary has been printed for family members. I found a record for smith’s obituary with the date of publishing (August 21, 1903) and newspaper it was featured in. Next, I utilized Genealogy Bank to search the Times Picayune archives. There it was. It was sort of weird to me though. This was my second direct ancestor who had died in a freak accident involving a street or road. Perhaps it’s a sign that I need to be careful in the street? 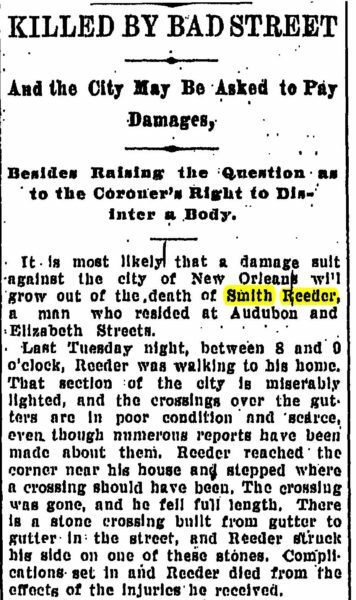 The article states that on August 18, 1903 at around 8 or 9pm, Grandpa Smith was walking to his house near Audubon and Elizabeth streets. Due to poor lighting and conditions, he stepped where a crossing should have been for a gutter and fell into it. It was hard for me to understand exactly what this meant. You can’t really “fall full length” into a gutter in today’s times. Gutters are just a short distance from the curb. I searched further online to learn about street conditions in New Orleans in the early 20th century. The first real hit in my search results was in the book New Orleans 1900 to 1920 by Mary Lou Widmer and Moon Landrieu, former mayor of New Orleans. This description reminded me a lot of what you see there, even today. Granted, pre-Katrina, the lightning conditions were probably better than they were in the early 1900’s, but even now, it’s not hard to fall into one of these. Reading the story further, even more comes to light. Apparently, the coroner’s office was notified and ordered that his body not be buried. Unfortunately, it was too late and his body had to be exhumed despite my family’s wishes. Further reading suggests that this was one of many issues with the drainage system in the city. Reforms around the same time lead to a decrease in diseases such as yellow fever, but I’m not sure if falling deaths decreased since it looks like a similar system is still in use. Regardless, I guess it really can be said that he was killed by a bad street.